It takes more than the flipping of a switch to connect the ITER site to the French national grid. The operation, called a "first energizing," is a complex, step-by-step procedure that requires close coordination with the French transmission system operator RTE (Réseau de transport d'électricité). ITER head of Plant Engineering Sergio Orlandi (centre) and the ITER ''electricians''—head of division Ivone Benfatto and section leader Joël Hourtoule, along with Jeremy Sanna and Marco Olivier—stand at the edge of the switchyard as operations unfold. Also present is head of Communications Laban Coblentz. For the moment, the electrical needs of the ITER worksite and buildings are covered by a 15 kV line extended from the neighbouring CEA research centre. But as activity increases the installation will feed directly from the grid through the switchyard that sprawls over four hectares at the southeast end of the platform. Preparation for this moment—an ITER Council milestone to be achieved during the first quarter of 2017—began on Friday 20 January at the first of the seven switchyard's "bays." 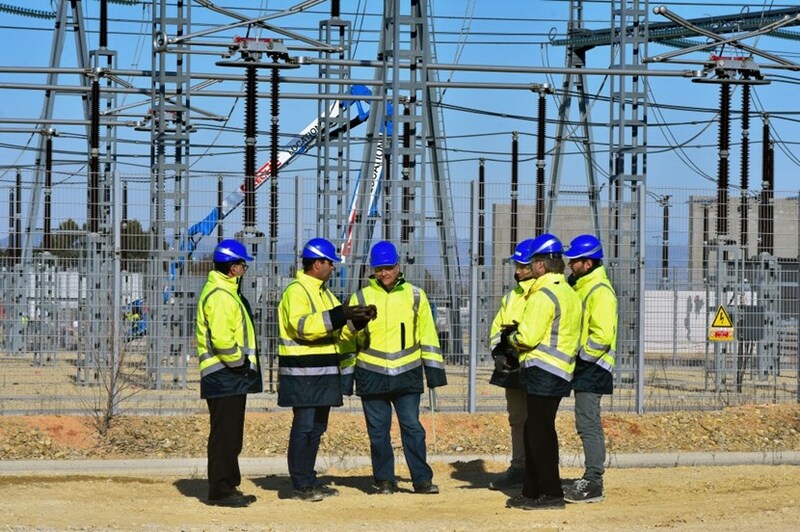 Busbars, switches, pantographs, breakers ... all of the complex equipment and systems that link the grid to the ITER transformers were activated and tested in close coordination with RTE control room in Marseille. Tests will continue for the other bays individually and will conclude with the energization of the entire switchyard. The steady state electrical network (SSEN), which occupies four bays out of seven, is set to be operational in June, whereas the pulsed power electrical network (PPEN), which is only needed for Tokamak operation, will be energized at a later date. Performed under "real" conditions, Friday's operations provided a precious opportunity to test and demonstrate the integration of the ITER installation (with all its specificities) into the environment of France's national grid. Beyond the technical dimension, they represented a full-fledged exercise in coordination, methodology, and safety procedures that will be applicable to other plant systems.